Henry Bennett, of Dycusburg, has filed suit against the parties, whom he names, and alleges burned his factory and distillery at Dycusburg, last Febuary [sic], and at the same time abused him unmercifully. The suit is filed against near one hundred citizens, of Trigg, Lyon and Caldwell counties and is for the sum of one hundred thousand dollars. 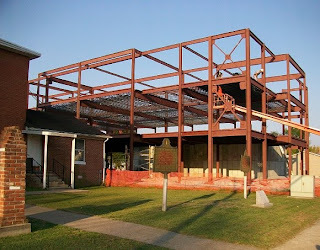 IN THE WORKS: The new county office building is under construction in this photo dated Sept. 2010. Courtesy/Brenda Joyce Jerome. The Livingston County Historical and Genealogical Society and its Preservation Committee are planning a Halloween event at the Livingston County Court House in Smithland on Friday, Oct. 29, 2010. The theme is "Haunting Tales From the Past." The evening will begin with music at 5 p.m., followed by stories of the Night Riders, murders and Civil War activities in Smithland and other stories of the area. Kentucky Supreme Court Justice Bill Cunningham will be on hand for a book signing. The Livingston County High School FFA will have food available for purchase. The new Livingston County Justice Center opened in 2009 and a new County Office Building, which will contain the county clerk's office, is currently being constructed next to the old Court House. When this happens, the old Court House will be empty for the first time since it was built in 1845. The purpose of this Halloween event is to make residents aware of the movement to preserve the Court House and adjoining old clerks' offices (built circa 1853) and provide the opportunity to contribute to the future of the Court House. This is the perfect way to have a family-friendly good time and support the preservation movement. (Editor's Note: This post was used with permission from http://wkygenealogy.blogspot.com, a site dedicated to history and genealogy from Western Kentucky). The L.B. and Sarah (Parsley) Patton reunion was held on Sunday, Oct. 10, at the Fredonia Lion's Club Building with many descendants in attendance. The family has been gathering for many years, always enjoying an afternoon of visiting and fellowship. The Pattons moved to Crittenden County in 1878 from Laurel County, Ky. This Saturday (weather permitting), the Dycusburg Community Group (DCG) will clean the town of Dycusburg, starting at 10 a.m. Those who wish to help should meet at the site of the future park. The DCG will provide bags and bottled water. If you live in Dycusburg and you need help removing trash, debris or other items from your property, please call 988-2758 or meet the group at the site and they will direct their efforts as they are able. Volunteers are also still needed to help with the set up of the park, particularly after the land survey is done and after the drainage culvert is installed. Until those items are complete, the park construction cannot begin. In the meantime, be thinking about ways you can volunteer to help the community. Parker Holsapple was honored with an 80th birthday celebration at the Dycusburg Baptist Church fellowship hall on Saturday with a large crowd in attendance. Owen Matthews, son of Chase and Jennifer Matthews, was treated to a first birthday party at the Calvary Baptist Church in Crayne on Saturday. Dycusburg Day, sponsored by Dycusburg Ladies Auxiliary, will be held at the Dycusburg Baptist Church from 2-4 p.m., Oct. 16. There will be a cake walk, two-liter ring toss, games, gospel singing and country music street dance. "Homecooking on the Cumberland" cookbooks will also available for $10. A large yard sale will also be held that day in Dycusburg. Are you missing a dog? Star Mahns found a small, black dog with a collar and no tags on Brown Mines Rd. Call 988-3004 to claim her. Our sympathies are extended to the families of Rhea Stinnett, Carlos Bailey and Ann Tabor.